Free Vision Board Planner AND Free Printables for Your Vision Board! I make a vision board every year and I’m in the middle of making one for 2018! I’ve written before that I’m a huge fan of vision boards. I believe the process of making a vision board and then putting it somewhere where you see it on a regular basis somehow speaks to our subconscious in a way that both helps us believe our dreams are possible and keeps our mind thinking about ways to make them happen. I also think that – maybe, just maybe – there’s a little bit of magic involved. Who am I to say there’s not? After all, I’ve certainly had some major success using vision boards in my life. As I reflect back on the boards I’ve made in some past years, I’ve actually accomplished or achieved most, if not all, the items on those boards, including marrying the love of my life which turned out to be the biggest and happiest surprise of them all. That’s why I was so disappointed in my 2016 Vision Board! I made it quickly at the end of 2015 and with the attitude that I was a vision board expert who didn’t need to review and commit to the process. So I went through some magazines, surfed the Internet, cut out some images that represented my goals for 2016, slapped them on poster board and hung it on a wall in my bedroom. And nothing happened! For me, getting through 2016 was like slogging through a messy, pointless hike. I made it to the end of the year, but there was no joy in the journey, no sense of purpose and ease. And I didn’t accomplish a single goal I put up on my vision board. So, when 2017 rolled around, I stopped to take some time to look at 2016 and figure out what I could have done differently to make the year easier. I went back to the basics I had neglected and changed up my routine a bit. I’m pleased to say that my vision board in 2017 was the most powerful board I’ve ever made. I made my it with the vague feeling that I’d like to be doing something different with my career. I didn’t have any particular goal or plans, I just wanted to shake things up a bit. I could never have imagined that I’d start 2018 working from home in my own business. That’s some powerful manifesting! Here are five things I did differently with my 2017 vision board. If you’ve ever wondered why your vision boards don’t work as magically as they seem to for other people, these tips will help you make a more effective vision board. I’ve created a free guide to help you follow these steps while creating your own vision board. It even includes some free printables to include on your board. Keep reading to find out how to get it! 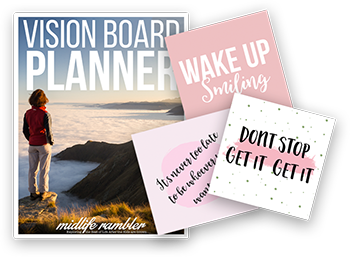 Download Your FREE VISION BOARD PLANNER NOW! Get all my tips for the most effective Vision Board ever, PLUS free printables to use on your board. Yay! Check your e-mail to download your planner right away! This is the biggie! In 2017, I focused on straight-forward images that represented the goals I wanted to achieve: I want to lose weight, I want to run a 5K, etc. But it’s really important to remember that we’re actually looking for the feelings we think we’ll have when we accomplish those goals. That way, we can already get a jump start on achieving our desired emotions when we look at the board and we leave ourselves open to reaching these emotions in a way other than we could envision. For example, I used to put all these pictures of different houses I wanted to live in on my vision boards. The types of living spaces changed over the years, but looking back I see that they always had the same theme: spaces that evoke a serene and contented feeling. So when I walked into the house I live in now, I knew instantly this was the place for us because that’s exactly how it made me feel. So instead of looking for images to represent the things I wanted, I spent a lot of time flipping through magazines and paying attention to the images I responded to. For example, I kept being drawn to an ad for the Today show that showed the hosts cooking on-air. I have no desire to be featured on the Today show giving cooking tips. (And believe me, no one else wants that either.) But somehow, this image represented how I wanted to feel while I’m working: engaged, happy, and creative. And that’s exactly how I feel now when I’m working. As a bonus, since I now work from home, I can tune into the Today show and see what they’re all whipping up. This doesn’t mean you can’t include images of physical things you want to own. There’s nothing wrong with desire! Just let the image remind of you of how you’d feel if you had that object. I do find, though, that I’m naturally moving away from the images I would choose for my early vision boards: giant rolls of dollar bills and beautiful, thin, accomplished women. The images I’m drawn to now represent the woman I want to continue to become: strong and happy in her own skin. If you’re going to focus on the way you want to feel, then you need to be clear on how you want to feel. That’s obvious, right? But it can actually be a bit tricky. We all want to feel happy, but happiness feels like different things to different people. It can even feel differently to you at different times of your life. Sometimes happiness can feel like relaxing by the beach without a care in the world. Other times it can feel like working hard for a cause you believe in. The key is to identify just how happiness feels for you right now. One thing that helps me to become clear on what happiness feels like for me right now is to sit down and write out what my ideal typical day would look like, starting from waking up. When and how do I want to want to wake up? How do I want to feel when I wake up? Do I want to feel relaxed and at ease, for example, or excited and ready to get going? I write out my entire day, focusing on what I want to be doing and why that would make me happy. My Vision Board Workbook walks you through determining what will bring the most happiness to your life right now. Going through the workbook can help you get clear on what your vision board should look like. My least effective vision boards are the ones where I’ve thumbed through a bunch of magazines, pasted a few pictures on my posterboard and called it a day. It takes time – and a lot of thinking – to make an effective vision board. I worked on my 2017 vision board on and off for a full month before I felt like I’d gotten things right. I like to spend a lot of time thinking and journaling about my intentions for the upcoming year and for my life in the next few years. I also like to make a list of what Martha Beck calls “Wildly Improbable Goals” and actually write them on the posterboard before I glue down a single image. Then I cover up what I have written with very carefully chosen images so my goals feel secret and special. That’s not something you need to do, but it helps make my vision board feel very personal to me. It’s holding secrets for me and you can’t get more intimate than that. There seem to be two schools of thoughts regarding what you should do with your completed vision board. Some people say that it’s best to hide the board away so it can work its magic but I like placing the board somewhere I can see it almost as soon as I wake up. For me, that’s usually my bathroom or bedroom wall. In his book, Blink, Malcolm Gladwell describes how simply reading a list of negative or positive words can affect a person’s behavior immediately afterward. Looking at your vision board first thing in the morning helps you start your day with powerful positive images and it’s even more helpful with some positive phrases to sink into your subconscious as you start the day. I also think that hanging your board where it might be seen by others conveys a powerful message. It says, “This is what I want for me and I’m not ashamed to let you see it because there is nothing wrong with wanting these things or feeling I deserve them.” That’s a great way to help overcome one of the largest barriers to vision board success: feeling you don’t deserve the things you want. I’ve made two wildly successful, can’t believe this actually worked!, vision boards in my life and I made them both at a vision board party, where we all came together, listened to music, shared images and craft supplies and created our vision boards. At the end – and actually all throughout the party – each participant shared their board with everyone else and explained what the board meant to them. The very act of coming together as a group raises the energy around your board exponentially because you are all operating on the same positive energy. And having someone hear your wildest dreams and tells you that they’re not crazy and that you can definitely achieve them; well, that’s an amazing way to overcome any resistance you may have around your dreams and break through any “I’m not good enough for this” barriers you may have. 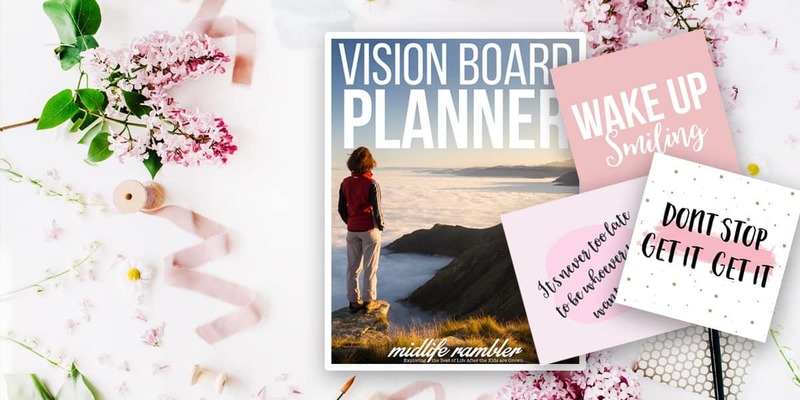 My downloadable Vision board workbook is a great resource for planning your own vision board party. If you can’t find enough like-minded people for a Vision Board party, completing your board with even one other person is enough to make your own board much more powerful. In fact, if you simply gather the courage to show and explain your board to a supportive friend, you’ll increase the power of your board significantly.